I hope you had a great weekend! I spent Friday and Saturday at a home school convention. Both my head and heart are full. :) Before we went away for the weekend I had some time to play. Yay! Simon Says Stamp had just sent me the Lovely Day Dies Set but I didn't have the matching Lovely Spring Stamp Set. I decided to challenge myself to make a card using the dies anyways. For the background panel, I die cut a piece of Neenah Cream cardstock using the rectangle from Simon's Bundle of Stitches Die Set and stamped it with Simon's Diagonal Stripes Background Stamp using Hero Arts Soft Vanilla Dye Ink. I die cut the wreathe, flowers, and banner from the Neenah cream cardstock as well. I did some Copic colouring, stamped of the sentiment, and pieced it all together (along with some sequins) on Simon's Kraft Woodgrain Cardstock that had been die cut using Simon's Square Stitches Die Set. I added some Clear Wink of Stella Glitter marker to the flowers, a sequin to largest one, and some Glossy Accents to the centers of the smaller flowers. 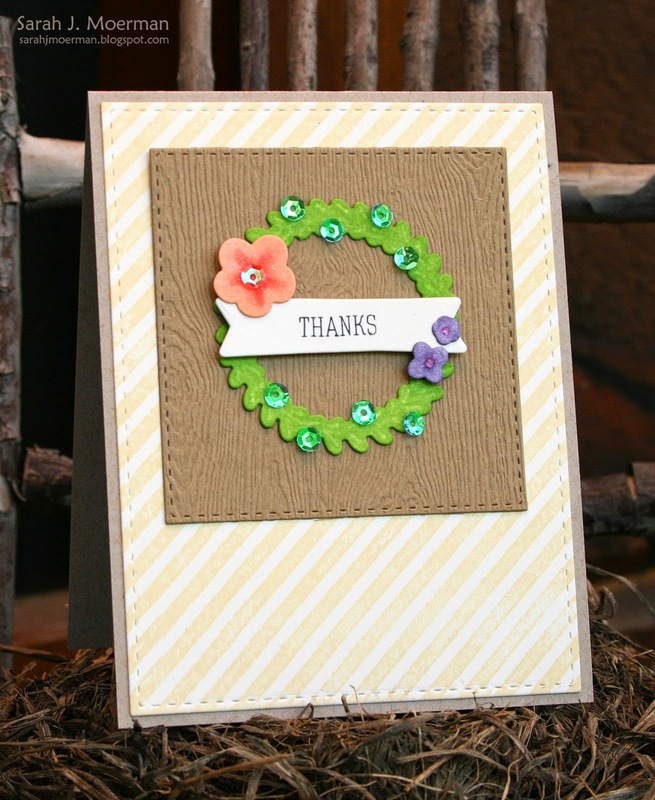 Love this super sweet card! very nice. love the wreath.